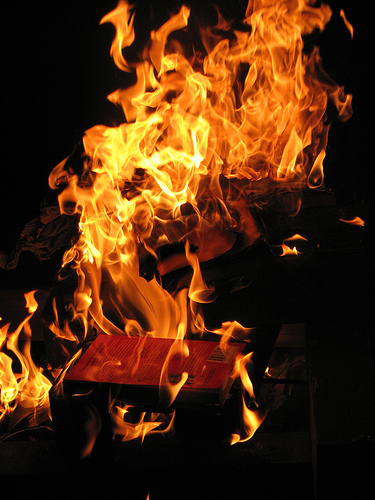 Quite understandably, book burning has a bad reputation. It is a scout badge for history’s nastiest antagonists – Nazis, Stalinists and the Taleban have indulged in it – and biblioclasm also provides the central motif for Ray Bradbury’s dystopian masterpiece Fahrenheit 451 (the temperature at which book paper burns), in which perversely named ‘firemen’ are tasked with obliterating burning outlawed books and occasionally the bookish. It is a matter of some regret that the destruction of digital material lacks such a visceral significance. In the Internet age, the abundance of recycling bins, dropboxes, archives and ‘the cloud’ all imply a permanence of data – and indeed, many civil liberty campaigners focus more on privacy and the ‘right to be forgotten’ than data retention. One can only hope that in the years to come, a webpage carrying ‘Error 401: unauthorised’ might in certain contexts engender the same reflexive horror. Because the recent actions of the Conservative Party – and to a different and perhaps lesser extent their Labour rivals – in removing or restricting access to previously public documents and videos should be seen as a shocking affront to open and accountable government. Imagine for a moment that the deleted material was physical rather than virtual. Whilst it’s a stretch to imagine Grant Shapps breaking into your grandmother’s home to incinerate her 2005 manifesto a la Bradbury, the revelation of a governing party’s in-house attempts to literally erase history would take us much closer to Watergate territory than the muted reaction that the virtual bonfire has incited. Because this was, after all, a shamelessly brazen attempt to make life easier for politicians seeking (re)election in 2015 – by making it much harder for voters to hold these representatives to account. While the tongue-in-cheek Twitterati has mostly focussed on the loss of meme-friendly material like David Cameron’s husky trip after assuming the leadership in 2005 and his ‘Webcameron’ series (won’t somebody please think of the gifs!) the basic ability of ordinary people to scrutinise how well the government has kept its pre-election pledges and promises has been dealt a genuine and solemn blow. One need only sift through the Tory party’s hapless responses to the revelations to see quite how egregious an affront to accountability this was. A Conservative spokesperson claimed that “the changes allow people to quickly and easily access the most important information we provide” – which is patently, outrageously false, unless you allow the party itself to define “most important information”, which, I suppose, is precisely what they have in mind. Adding to the bitter, twisted irony was the fact that among the reams of deleted material were speeches given by Cameron and George Osborne about Internet freedom and transparency.